CHAMPAIGN, Ill., 3/26/18: Small differences in incubation temperatures as robin embryos develop in eggs can significantly affect growth and survival once they hatch, according to a new University of Illinois study. A research team from the Illinois Natural History Survey (INHS), among the first to study incubation temperatures for open-nest birds, artificially incubated American robin eggs at 97 degrees or at 100 degrees. They also monitored temperatures of eggs in their nests in a natural, outdoor setting with female robins incubating the eggs. Researchers discovered that embryos incubated at the higher artificial temperature hatched faster, but the newly hatched birds were smaller than those incubated in the nest. The decreased hatch time was significant, with only 10.2 days for the eggs incubated at a high-temperature and 11.5 days for those at a lower temperature. The length of the incubation period was the longest for eggs naturally incubated in their nests, 12 days. A faster hatch time can be beneficial in that it shortens the time that eggs are vulnerable to predators. However, birds that hatch faster tend to be smaller, with less chance of survival once they leave the nest, Benson said. When researchers checked the size of hatchlings at age 7 and 10 days, they found that hatchlings that were naturally incubated were the largest and had the highest probability of survival. 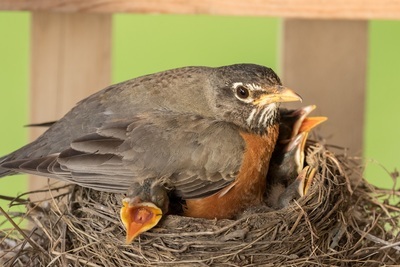 Temperature fluctuations caused by the female robin leaving the nest to forage or flee from a disturbance may be the key to the longer hatch time, larger size, and higher survival rate seen in naturally incubated eggs, according to co-author Loren Merrill, a post-doctoral researcher at INHS. Under constant temperatures, as in the experimental incubation, embryos are forced to develop at a constant, high rate. Possibly, the developing embryo needs periods of reduced temperatures, as when the mother leaves the nest, to “rest” from the rapid development, suggested Merrill. But too many periods of reduced temperatures may also have deleterious consequences, as the results from the low temperature treatment indicate. Moreover, the notion that slight temperature changes during incubation can have profound effects on birds that hatch in open nests has far-reaching implications, since a majority of birds build open nests. Human-related changes to the landscape, increases in nest predators, direct human disturbance, and changing weather patterns may create more disturbances for birds. If incubating birds leave the eggs more often or for longer periods due to these disturbances, incubation temperatures could be reduced. “If this happens to enough individuals, and the effects are similar to what we see in robins, we could see population-level decreases for many species over time,” Merrill said. INHS provided the funding for this study, which was published in the journal Ecology and Evolution, DOI:10.1002/ece3.3911.